You can choose to immediately notify a predefined trusted group of "First Responders" regarding a lost child, along with a link to a live view of the child’s location & directions to that child. The First Responders do not need to download the app, the live updates will be to their browser. Create your First Responder group, typically - friends, family, caregivers, school staff, law enforcement and search and rescue teams. When activated, each member receives an email and text with temporary credentials, valid for 24 hours or until the test or emergency is called off, whichever comes first. Upon clicking the provided link, the AngelSense web app is opened for them online. It is not necessary for them to install the app on their device or computer. 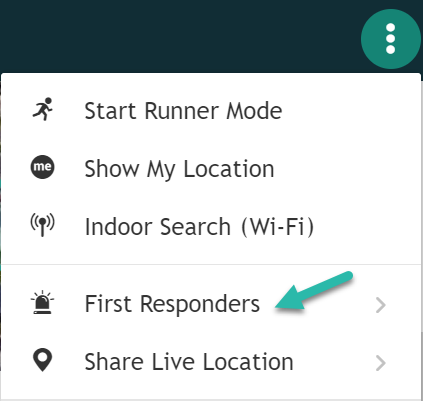 Members of the First Responder group have access to Runner Mode (excluding the calling features and First Responder activation icons) to help locate your child. First Responders have read-only access and cannot access the historical schedule. Note: All "Regular Guardians" (not including School Guardians) are First Responders as well, i.e. they will get the First Responder activation notifications. Guardians can always access the app. First Responders can only access the app when you activate the First Responder alert. If you deactivate First Responder (press again the icon) or after an automatic 24 hours timeout, First Responders will no longer have access to the app.